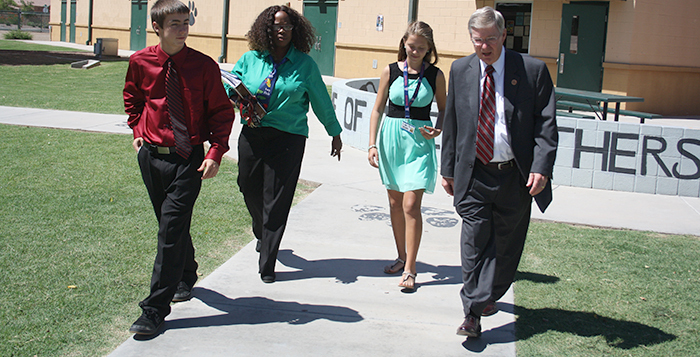 Two Maricopa schools gave state Rep. Vince Leach a tour of their campuses Wednesday for Take Your Legislator to School Day. “I’m learning a lot,” Leach said throughout the day. Leach shadowed Angelia Ebner, the vice president of the Maricopa Education Association and a nationally board certified teacher, at MES. Ebner also accompanied him as he toured MWMS with Treva Jenkins, an Arizona Master Teacher and K-12 Center Mentor Teacher, and students Steel Lewis and Cassidy Zimmerman. He looked in on a history class with Keith Gibson and, as a history major, swapped notes with the 30-year teaching veteran. Leach also looked at the computer lab and other tech rooms, a Spanish class, a Special Education class and more. He spoke with teachers about everything from furniture to computer servers. Leach particularly noted the extra effort needed to gain certification in Arizona even for those veteran teachers long certified in other states with tougher certification processes. He said it was contributing to the teacher shortage. “We, and I mean we the Legislature, need to find a way not to put up roadblocks,” he said. Eighth graders Cassidy and Steel fielded questions from the politician and others, ready to explain classrooms and programs. When asked by Ebner what she tells parents who ask her why their children should attend MWMS, Cassidy said there is an outdated misconception that it is a bad school. “They should definitely come here and find out,” she said. Take Your Legislator to School Day is a partnership among the Arizona Educational Foundation, the Arizona K-12 Center, the Arizona Education Association and the Rodel Foundation.